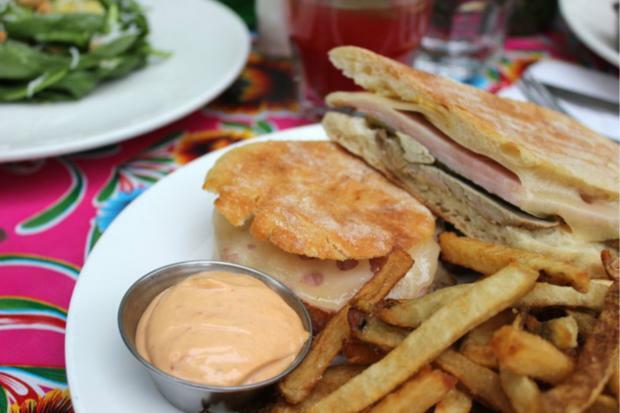 Esperanto Fonda offers a Cubano sandwiches with roasted pork loin, ham, melted Swiss, and mojo sauce. EAST VILLAGE — A 17-year-old cafe with Brazilian-inspired cuisine is branching out with a new neighborhood spot that will offer quick eats such as empanadas and tacos. Avenue C eatery Esperanto on Aug. 1 will unveil its new quick-service cafe at 58 E. First St., Esperanto Fonda, where fans of the neighborhood mainstay’s Latin American dishes will be able to sit down for a quick meal complete with house cocktails or take their food to go. While the original dine-in location offers full plates such as hearty Brazilian stews and a Carne Grelhada steak dish, Esperanto Fonda will allow patrons to grab to-go-friendly items such as tacos, empanadas, burritos, and a Cubano sandwich with roasted pork loin, ham, melted Swiss cheese and mojo sauce. The new 30-seat cafe will also offer a casual dine-in experience, including Mojitos, Brazilian Sangria and other cocktails from the Avenue C eatery. You can check out the full menus at both locations here.